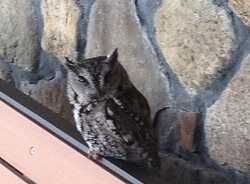 On a cold January day a screech owl came to pay a visit at Sun Dancer Lodge. We walked in and out the adjacent door that was less than 5 feet away many times during the day. The owl followed our every move but did not fly away. After dark we looked again but the owl was gone, likely off hunting. 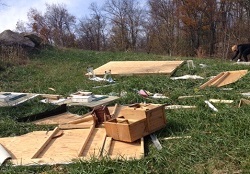 While still recovering from Hurricane Sandy with a new replacement Amish built playhouse in place, we experienced yet another bad wind storm that removed the shingles from one side of the structure. Hurricane Sandy caused a lot of problems at The Lodges. Eleven major trees were taken down, 15 sections of fence destroyed, hot tub covers ripped off, the tubs filled with trash, and the playhouse completely destroyed. It will take many weekends to cut and split all the wood and cleanup the debris. The playhouse is clearly not salvageable and will have to be replaced.